You can learn a lot about a person’s fitness and training by observing heart rate. It is a simple metric that is easily and cheaply measured, but its value by far exceeds the trivial cost and effort to obtain it. As an assessment tool for cardiovascular fitness, it’s hard to beat. In this article, we’ll talk about heart rate reserve and some simple ways to use heart rate to demonstrate changes in fitness. The reason it is such a good measure is because it is a good marker for our ability to do high intensity work. We can use it to gain some insight into our reserve capacity. When I was 19 I had a 50cc Honda Scooter. I was a beefy 200 pounds at the time. I had to crack the throttle to about ¾ max just to keep up with traffic on neighborhood streets. That gave me about 25 mph. Full throttle got me to about 30 mph. I had almost no reserve capacity! It took me less than a year to burn up the engine because I was full throttle almost all the time. A few years later I was working for a major oil company, delivering smoking cessation classes on offshore oil platforms. On my first day, first oil platform, the manager welcomed me aboard. I was to present the class the next morning. He mentioned that I would be rooming that night with “Big Hoss” and that it would be an experience I would never forget! Turns out Big Hoss snored like a freight train. Well, five minutes later Big Hoss walked in. He had just walked up a single flight of stairs and was so winded he had to sit down for 15 minutes. His heart was racing, and he was breathing hard like he had just run a 10K. Later I had a long discussion with Big Hoss about his health and I had a chance to measure his resting heart rate after he had fully recovered. It was > 120 beats per minute! His throttle was at ¾ just sitting there! Like my 50cc scooter, he was very near max capacity just “keeping up with traffic.” He had very little reserve capacity for simple exertions like walking up stairs. He was well on his way to burning up his engine (congestive heart failure). He had very little heart rate reserve. Let’s build a theoretical car to help understand this concept, so that we can apply it to some practical uses. 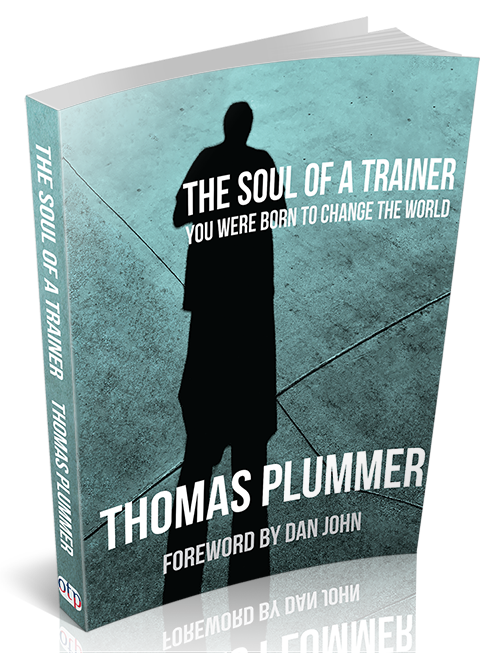 Think of the heart as a fuel pump and the muscles as the engine. In a car the fuel is gas, in the body it is oxygen. Just like in a car, there is a fuel cost to sit at idle. In a car the fuel cost of sitting at idle might be ¼ gallon per hour. For the body, the cost of sitting at rest is about 5 liters per minute. Let’s look at the table below to gain a deeper understanding. Typical resting heart rate is 70 beats per minute. The typical amount of blood pumped per beat (called stroke volume, the volume pumped per “stroke”) is about 70 milliliters. If the heart rate is 70 BPM and the stroke volume is 70 ml, then the cardiac output would be 70 BPM X 70 ml = 4.9 liters per minute. This is the cost to sit at idle. How about the cost to put the pedal to the metal? Again, this can be calculated by multiplying heart rate by stroke volume. However, stroke volume is not a constant. It increases with increasing exercise intensity. At rest it may be about 70 ml, but at max exercise it could almost double. In our example it increases to a typical value of 135 ml. The reason that stroke volume increases is because during exercise, more blood is returned to the heart, so more blood is ejected with each beat. You can see in the table above that with the pedal to the medal (max exercise capacity), we are pumping 25 liters per minute. That is a reserve capacity of 20 liters per minute (25 liters – 5 liters = 20 liters). This reserve capacity is the excess capacity above and beyond sitting at idle (resting value). So, let’s examine Big Hoss’s problem. But before we do, you need to know one more thing: Maximum heart rate does not decline with fitness. An unfit person would tend to have the same (or even greater) maximum heart rate as a very fit person. We can loosely estimate maximum heart rate by subtracting 220 by age in years. Let’s assume we are comparing a “normal” person, who is 35 years old, with 35-year-old Bigg Hoss. The normal person is sitting at idle (rest) with a heart rate of 70 and a predicted max heart rate of 185 beats per minute (220 – 35). The normal persons reserve capacity would be 185 – 70 = 115 beats per minute. Bigg Hoss would have the same max heart rate, but his resting heart rate was 135 BPM, so his reserve capacity would be 185 – 130 = 55 beats per minute. This is illustrated below. Blue represents the cost at rest and orange represents the reserve capacity. A normal person would be sitting at about 35% max capacity at rest but Bigg Hoss was at nearly 70%! One more chart to really get to the crux of the problem. Both Bigg Hoss and a normal person would have approximately the same fuel cost at rest (5 liters per minute) but it takes Bigg Hoss almost twice as many beats per minute to get the same fuel pumped. This is because his stroke volume is almost half of a normal person’s value! In the chart below, you can see that his stroke volume is 37 ml, compared to a normal value of 70 ml. This is the crux of the problem. His heart is weak. It only pumps out about half as much blood per beat as it should. Which brings us back to our simple metric, heart rate. I did not need to do all those calculations to know that Bigg Hoss was in trouble. All I needed was his resting heart rate. Because it was about double what it should be, I knew that his stroke volume was about half of what it should be. His heart was weak. Think about the opposite end of the spectrum, someone like Lance Armstrong, who had a resting heart rate of 35 BPM! This brings us to our first metric, resting heart rate. Remember that maximum heart rate is not going to change much (if at all) as you get more fit. If you don’t know your maximum heart rate, use 220-age in years as a very loose approximation. If you know it, use the real number. See the text box “A Note About Maximum Heart Rate “ for more information. Below is an example of a typical increase in heart rate reserve over a three month period of moderate aerobic exercise. 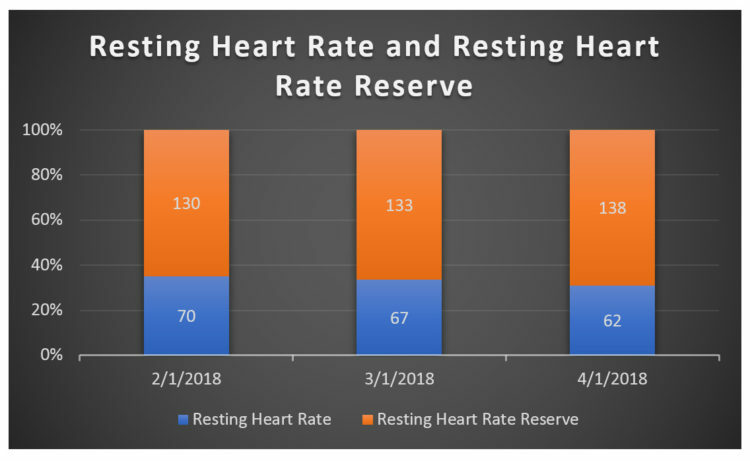 Note that the resting heart rate went down (blue) and as a result, the heart rate reserve went up (orange). 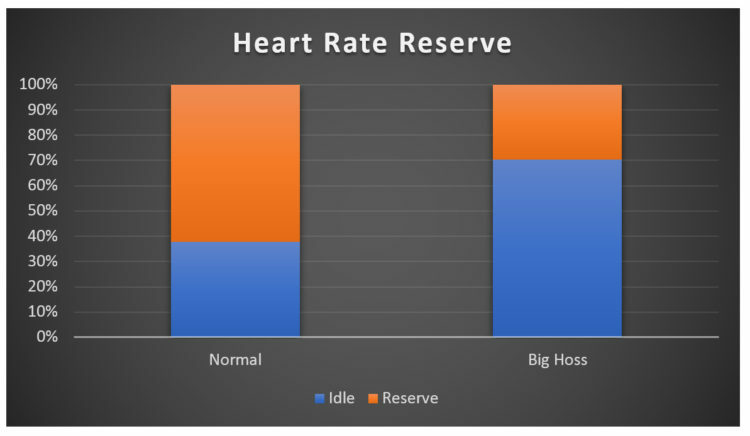 The resting heart rate reserve represents the extra beats, above and beyond what we need at idle (rest). An increase represents an increasing capacity to do high intensity work (we have more left over to do work). There are several ways to measure or estimate your maximum heart rate. They are presented in order of accuracy (best to worst) below. Maximum heart rate observed during a laboratory VO2 max test. This is an expensive option but the most accurate available. Maximum heart rate observed during a graded exercise test. This can be done with either a treadmill or a stationary bike. During this type of test you simply increase the exercise intensity by a fixed amount every minute until the person cannot continue. The test is considered to be valid if exhaustion occurs between 7 and 15 minutes (adjust intensity accordingly). An example would be to set a treadmill at a 2% grade and 3 miles per hour, and increase the speed by 0.5 miles per hour every minute until exhaustion. Maximum heart rate at the end of a 1-2-mile run, with a hard sprint finish. Highest heart rate observed over a mix of training intensities from moderate to maximum (over a longer observation period of weeks or more). A better measure is to take your average heart rate for a fixed exercise intensity and calculate a working heart rate reserve (as opposed to a resting heart rate reserve). This is similar to the resting heart rate reserve, but we are using the working heart rate instead of the resting heart rate. In this case, you don’t need a maximum, or even a strenuous exercise intensity. For example, we might take our average heart rate while walking on the treadmill at a 5% grade, at 4 miles per hour. Or, we might take our average heart rate while doing 24 kg kettlebell swings, 15 every minute, on the minute. Generally, we choose an exercise intensity that results in a heart rate above 110 beats per minute, but not so high that the test is exhausting. For this type of test, we want to ignore the first two minutes because it takes a couple of minutes for heart rate to climb to steady state, and we want to measure at least a five-minute period (and take the average). We also want to test and re-test under similar conditions (temperature, hydration, time of day, caffeine intake). If we repeat this test, we can gauge fitness. Let’s assume that on the same days we took our resting heart rate, we also conducted an exercise test (ten kettlebell swings on the minute, every minute for ten minutes) and took the average heart rate for the last eight minutes. We could simply plot our average working heart rate, which we would expect to decrease. But I always prefer to think in terms of functional gain. In this case, we can see a steady decrease in the heart rate response to the same exercise load every month, indicating that our heart is getting stronger (greater stroke volume). Calculate the % heart rate reserve used. The plot below shows the % heart rate reserve data calculated using the Karvonen Formula over a three-month period. 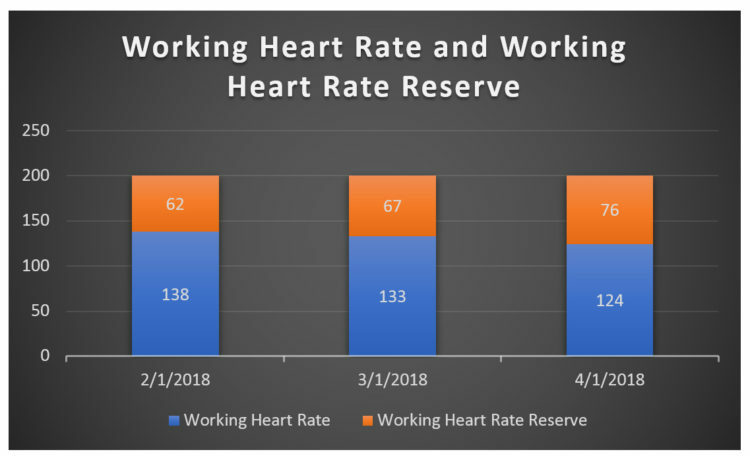 You can see that the same work effort requires a lower and lower percentage of our heart rate reserve (requires a lower % of our reserve capacity). Calculating the % heart rate reserve gives you a quantifiable metric that can take into account both changes in resting and maximum heart rate over time. Resting heart rate to go down with increased fitness. Resting heart rate reserve to go up with increased fitness. 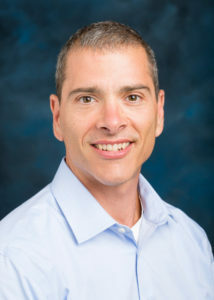 Working heart rate reserve to go up with increased fitness. 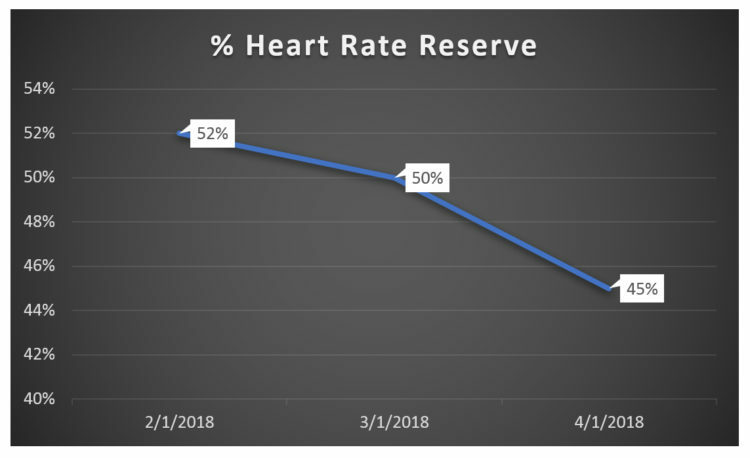 % heart rate reserve to go down with increased fitness.